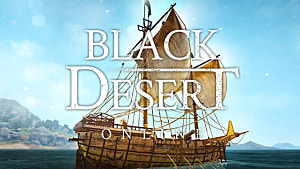 As with most MMOs, there’s always some sort of event running in Black Desert Online that rewards players with money and items just for playing the game. 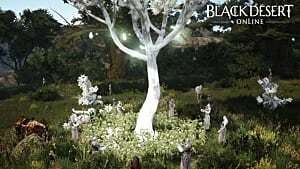 However, as the name suggests, DIY Time with Lavientia is a little more involved than some of BDO’s other events (like the one with Lauren's Family Coins) as it involves managing and even grinding for the event materials. For the duration of the event -- and once per daily reset -- the game will reward you with a small number of Lavientia’s materials after an hour of playtime. The amount of materials you’ll wind up with from the daily rewards ultimately depends on how long the event will last, but this most recent event lasts from 3/1 to 3/20 -- so, in this case you’ll, receive up to 20 days' worth of rewards. 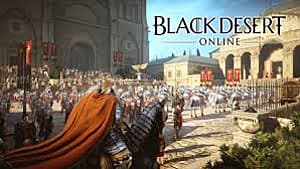 That means you’ll receive 400 Lavientia's Rings, 200 Silver Powder, 100 Gold Powder, 40 Big Diamonds, and 40 Ancient Pearls. 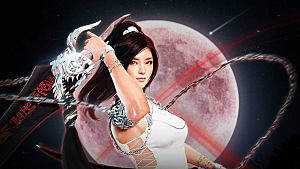 You’ll also be able to obtain some of these materials through grinding, fishing, and gathering, though you shouldn’t count on getting many Ancient Pearls this way (you’ll probably get at most two or three by the event’s end). 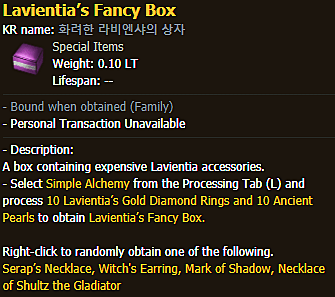 There are two consumable items and five event “boxes” you can craft with Lavientia’s Materials -- all you have to do is collect the required ingredients and toss them into the Simple Alchemy tab in the Processing menu. Because many of the components for the Lavientia Boxes are other Lavientia items, we recommend saving all your materials until the end of the event before deciding what to craft. 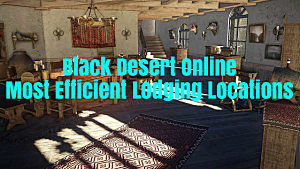 We’ll also be starting from the top to give you a better idea of how you should be managing your materials. 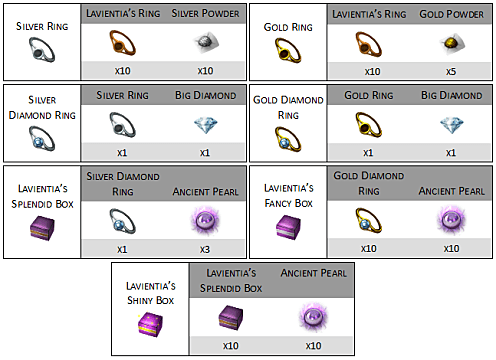 Lavientia’s Shiny Box has the exact same drop table as a Fine Accessory Box, giving it the highest average silver value of all the boxes -- you’re probably going to want make one of these. However, for this particular Lavientia event, you’ll need all 40 of the Ancient Pearls you get from your daily rewards to craft it, so if you're not a fan of putting all your eggs in one basket (or in this case, pearls in a box), you may want to pass on it this time around. Still, even the cheapest item, the Ring of Crescent Guardian (currently valued at about 45 million silver on the market) gives this box a minimum return of about 1 million silver per Ancient Pearl. The Fancy Box is probably the worst out of all the event boxes, as the raw silver worth of the Mark of Shadow and the Necklace of Shultz the Gladiator (they’re also probably the two most common drops) really brings down the box’s average value -- you could receive as little as 300 or 500 thousand silver per Pearl with this box. 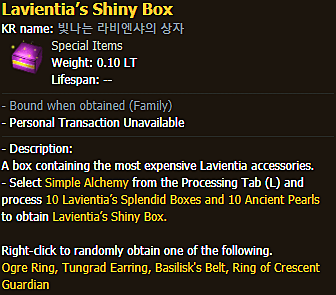 Furthermore, if you do spend a whopping 10 Ancient Pearls to craft even just one of these, there’s almost no way you’ll have enough leftover for Lavientia’s Shiny Box. 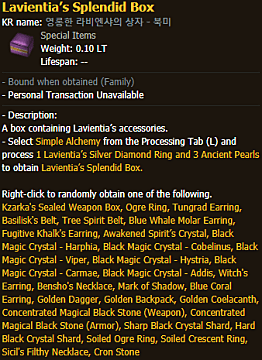 Lavientia’s Splendid Box is a little worse than your standard event box, which is a shame, because you won’t even be able to craft one per day with the materials you’re given. That being said, it’s not actually a bad idea to try to craft and open as many of these as you can, as 13 (or possibly even 14) Splendid Boxes could very well provide you with the same value that a Shiny Box could. However, if you are shooting for a Shiny Box, you’re probably not going to have any Splendid Boxes left over to open for yourself. 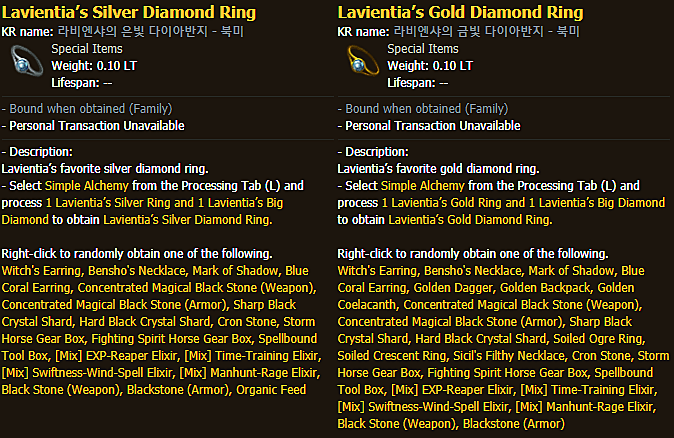 Lavientia’s Silver and Gold Diamond Rings are the base-level event boxes, and they’re also components used for crafting the more valuable Fancy, Splendid, and Shiny boxes. Given that these are the only event boxes that don’t require Ancient Pearls to craft, you’ll probably be able to crack open a decent number of them. 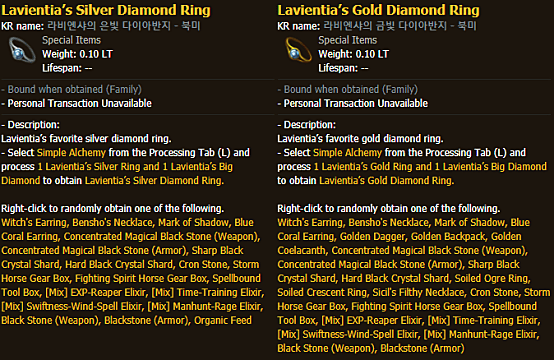 The two Lavientia’s Diamond Rings have fairly similar drop lists, but it’s pretty safe to say that the Gold Diamond Rings have a higher average value with the inclusion of the 5-million silver Golden items, and the Soiled items give you a shot at opening a jackpot accessory. The Silver Diamond Rings have… Organic Feed. 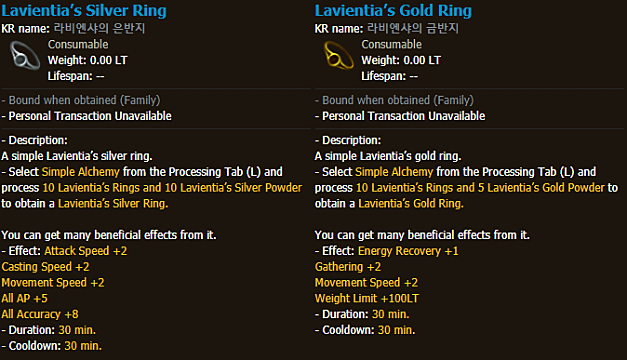 The two basic event items are Lavientia’s Silver Ring and Lavientia's Gold Ring. Not only are they consumables (one for combat, one for lifeskilling), they’re also used to craft everything else listed above. 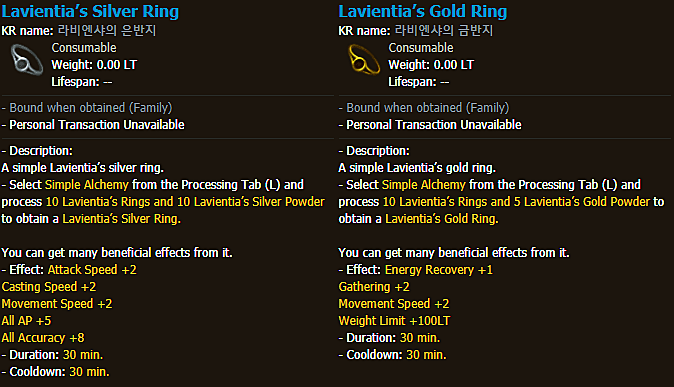 Because they're all the way at the bottom of the crafting food chain, there’s no reason not to craft as many Silver and Gold Rings as you can -- however, if you have too much Silver and Gold Powder and not enough Lavientia’s Rings, you’ll have to figure out which one you value more. 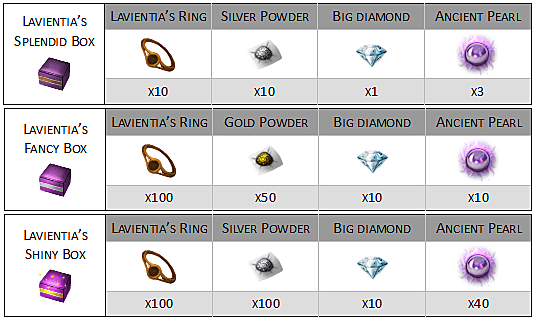 For most players, we recommend first crafting Lavientia's Shiny Box, making as many Gold Diamond Rings as possible, and then using whatever's left to make Silver Diamond Rings. 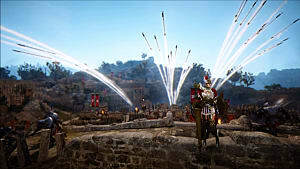 However, in the end, what you do with Lavientia's materials is up to you, and hopefully this guide gave you some insight into how you should use them!